Read In . . .
Oh, hey. It’s been a looooooong time, hasn’t it? I told you I’m never good at keeping up with blogs, but this year I’m determined (and also sort of, kind of required to but not exactly). I also really want to. After six years in the classroom, I finally feel like a good teacher, and I feel like I have something to offer other teachers. That said, I’m done rambling. Here’s the plan for my next few posts: “How I Prepared Kids for the AP Lit Test,” “High School Classroom Decor,” and a whole slew of book reviews. I’m also planning to make some KonMari checklists and graphics and talk about decluttering and organizing a space to feel like you’re a real adult with your life together-ish. Today, though, I want to talk about the first day of school. I’m a bit in denial that my first day with kids is NEXT WEEK. How?! I haven’t finished even half of my TBR! I need more reading time! Seriously, though, I’m excited now that I’ve been in and started setting up my classroom (new this year: no desks). Want a sneak peek of my new classroom? Follow @athomeintheclassroom on Instagram. I won a classroom makeover from my District at the end of last year, and these ladies are helping me transform my new room! Last summer, I saw a blog post about using stations for the first day of school, and I’m a huge fan of stations in other situations, so I decided to steal a few of Brynn’s ideas and create some of my own. In the past, I’d been the really boring teacher who highlighted parts of the syllabus and read through the “Code of Conduct” highlights before I had to collect signatures (English teachers see all kids every day, so we are blessed with this responsibility!). I hated doing it, I’m sure the kids hated me doing it, so I thought long and hard about what I wanted to do to change it up. I remembered that the only thing I wanted to do on the first day of school was talk to my friends and catch up (let’s be honest, I still want to do this), so that’s what I set out to do. I’m an English teacher. I like words (and, apparently, parentheses! HA!). My syllabus has lots and lots of words. I teach juniors and seniors, and if they don’t know how to read on their own then I have a problem. I never had a college professor read the syllabus to me–I was expected to read it before I came to class the first day or on my own time after the first class and before the second. It’s time my own students learn how to do this. I designed a collaborative little scavenger hunt using items I wanted to highlight from the syllabus, and I set a timer for 5 minutes. The group had to locate and answer questions, and each student in the group with the highest number of points got a sympathy pass (a two-day extension on any assignment other than summer reading and end of semester assignments). I may update a few questions, but it served its purpose this year. Students then take the syllabus home, read it thoroughly, and sign their name (and get a parent to sign as well). I’m a huge fan of goal setting. I set hourly, daily, weekly, monthly, and yearly goals for myself, so I encourage my students to set goals each semester. I give them a graphic organizer (optional to begin with but required if they have to amend their goal because of not following directions) to help them plan their goal if they don’t already know how to create a SMART goal (my school does this as a whole, so most of my kids already know), and I also have them write their goal onto this handout. I MAY move this over to Google Forms and have kids use their phones with a shortened link and/or QR code on the directions, but I haven’t moved this form over electronically yet. We’ll see if it happens! We’re a POD (personally owned device) school, so kids usually have a device (and can use their phones with Google Forms, if needed). By the way, I’m sure I stole the graphic organizer at some point from somewhere, but I have no idea where and couldn’t find it. If it belongs to you, I’m happy to give you credit; send me an e-mail! At one point, I saw an activity on Pinterest where you ask kids questions, and they answer on little sticky notes, and I’ve done it for the last few years, laminated the sticky notes onto the chart paper, and kept them on the walls the entire year. This year, I don’t have much wall space (I’ve moved to a room with a window! ), so I’m not sure if I’ll keep this activity or not. I’ve debated having kids use Padlet and making it a little more interactive and permanent (just not hanging on the walls). I added questions over the years, but I can’t find a more recent picture. What do you hope to learn this year in English? What should kids in our class be doing to make sure our class runs as smooth as possible? What will you need to do in order to be successful this year? What will Ms. Tripp need to do to help you this year? Our classroom should be ________ every day. English is important because ________. Station 4: Because I’m Happy! I’ve always been someone who tries to focus on the positives and things that make me happy rather than dwell on what makes me upset (I’m human, though!). 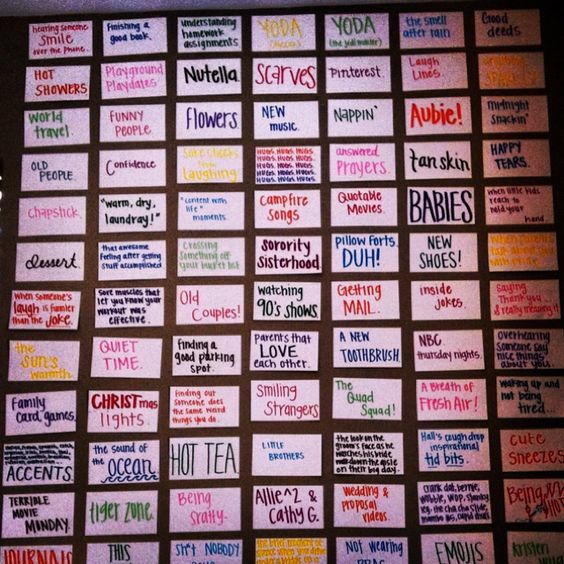 I wanted to find a way to incorporate this into the classroom, so when I saw this on Pinterest, I knew I had to do it! I’ll find a space for this in my room again this year, no matter what! I include the picture on my directions (see the bottom of this post), and I don’t hang any up that are inappropriate. I ask kids to write their names on the back in the directions, which usually curbs inappropriate comments, but if there is something that isn’t school appropriate, then I have an individual conversation with the student who wrote it, and we discuss what might have been a more productive option. Last year, I also had students decorate popsicle sticks at this station, but I never once used them to call on students because I didn’t need to (I think I do a pretty good job of building relationships and a safe environment where all of my kids are willing to share out–another potential post??). I buy nice cardstock and cut them all the same size (2.2″ x 4.25″) using my personal paper cutter (best 40% off coupon I ever used at Michael’s!). Station 5: STOP! Survey Time . . . Sympathy pass to the first student who can guess the reference! One of the ways I build relationships with my students is through surveys. I do a basic student inventory survey and a reading interest-a-lyzer survey about reading habits (inspired by Donalyn Miller). This summer, I moved these handouts onto Google Forms, so I can reference them anytime I want. I’ve tried everything to share my Forms, but I haven’t been able to share any outside of my district. You can view them here and here, though. I updated a few of the questions! English teachers have the honors on this one. Our administration sends us pages to cover and highlight. I give kids a copy of those pages and make it over to that group every rotation to make sure every kid signs saying they’ve reviewed the Code of Conduct. Because I have upperclassmen, they know the drill. I just point out anything that’s changed or been added and answer any questions if they have them. I needed an 8th station this year, so I’ve been inspired by the AP Lit group on Facebook to have students quickly read and discuss a poem in a small group. I’m not sure which one I will choose (any suggestions? ), but I will make sure it’s short! I love this idea! Thanks to David Rickert for inspiring me to add something a little more “academic” to the day. In the past, I’ve also had students write a personal essay answering the question, “Who am I?” based on the symbols on their mandala, but I’ve cut that out to save time. I mainly care about building relationships and connections, getting my students’ creativity flowing, and getting them in front of their peers to talk about themselves with this assignment. Not only do I get to know my kids better this way but their classmates do, too. This assignment constantly shows up on end of year surveys as being one of the favorites. Here’s an editable copy of the personal mandala assignment. Tip: I’m going to draw a circle and print it on cardstock for next year and have kids use my circle. This will help save on space, and I think it will just work better for my current classroom, but you can see I’ve not done that in the past. It’s totally up to you! Tip: On the day of presentations, you can have kids write one positive note to a student they might not know well yet based on their interests and share their phone number. This helps build connections and friendships in your class! Lastly, I also send kids home with a copy of my library letter to sign and bring back. I have a huge classroom library, and this covers me. I load kids who have permission to check out my books into my Booksource Classroom Library app. If a kid wants to check out a book but isn’t in my phone, they must bring back a signed form! I wrote this years ago, but I am pretty sure I used Kelly Gallagher’s letter from Readicide as my model. If you print station signs to hang from the ceiling, make sure you print the station titles on both sides of the cardstock . . . HAHAHAHA. Five minutes per station might not be enough time . . . be okay extending this part of another day if you need to and have a short period! I keep the groups together even when the activities are individual. Kids remember this day at the end of the year! I love it! My AP kids definitely handle it better than my juniors, so I’d spend more time giving directions to gen ed groups. If you want my fonts to show up on the editable Word docs (I’m old; I haven’t transferred most of my Word docs to Google Docs yet, please don’t judge! ), you may download Kimberly Geswein’s font bundle on TpT! I found this blog post on Eat. Write. Teach.’s blog about stations that looks pretty cool, too, but you’d have to purchase it. I’m not sponsored, I was just trying to find the original blog post that inspired me and came across this! I have not purchased it. I love that poem! I actually teach it in our first unit and have tons of discussion, so I didn’t want to take it away from there and only give it a few minutes. Thanks for the suggestion! Isn’t that one so much fun to teach? Haha, great minds think alike I guess. 🙂 It is an awesome one. I love these station ideas for the first days of school! This is a great post; thanks for sharing your ideas. I do stations at other times of the year, so something like this totally makes sense… and is far less boring than the typical 1st day for most of my kids. Thanks for sharing these ideas. I plan to use some of them. The room looks awesome too. I love your ideas!!! I’m starting my 17th year teaching, but my first teaching AP Lit., so I’m about apprehensive about…oh, EVERYTHING!!! Could you explain station 4 a bit more, please?? I love the picture, just couldn’t find the directions. Thank you so much for sharing your creativity with this old teacher, lol!! I’m glad you found this post helpful! I felt the same way starting AP last year, but it ended up being the greatest teaching experience of my career. The kids will absolutely astonish you with their insights. My biggest piece of advice is to just be honest with the kids when you don’t know something. They appreciate that, and it teaches them that it’s okay to not catch every single thing about a text on the first try. Station 4 is just for kids to decorate a tag to hang up in the classroom. They use the picture as a model, and I tell them to write something [appropriate] that makes them happy, that brings them joy, that they are grateful for, or that they couldn’t live without. I think it’s good to specify that the more specific the tag, the better! I get a lot of repeats, but I pick the most creative of the repetitive tags, so I tell the kids to be as creative as possible. Directions for the kids are linked at the bottom of the post, so the directions I give to the kids are there. I’ve done this for a few years now, and the kids catch on quick! I absolutely love this post. I want to use some of these but we start school Monday and I don’t think I have enough time to prepare. I so many things other things to do before Monday. Do you think this can work over the 1st week of school as well? Also, how can I subscribe to your blog? You should be able to subscribe to the blog using the little link in the right-hand sidebar. Just enter your e-mail address there. Let me know if that doesn’t work. You could absolutely spread these activities out over several days! I have a couple teachers in my school who do a syllabus scavenger hunt the first day, surveys another day, goal setting another day, and class expectations another. It doesn’t end up being stations, but the activities themselves are valuable however you do them! Let me know how it goes, and I wish you a wonderful first week!